Same oven is £64.99 on Amazon, and £52.99 on Vonshef websites. TIMER & TEMPERATURE CONTROLS - select a temperature between 70°C - 230°C and a cooking time between 0-100 minutes. 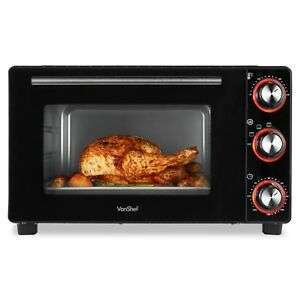 The mini oven will automatically power down once the cooking process is complete. Same oven is £52.99 on the Vonshef website, and £64.99 on Amazon. Ideal for cooking smaller quantities of food if not using your main oven.